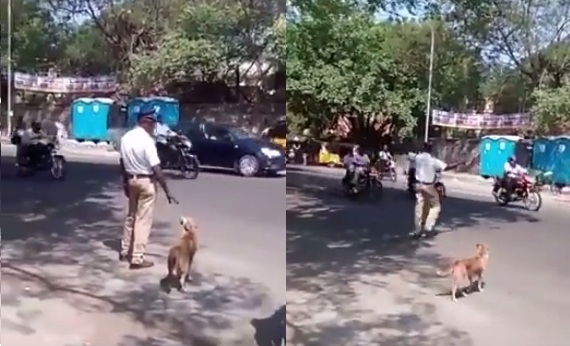 A little kindness really goes a long way: A stray dog in India got a much-needed helping hand from a kind traffic cop this week, who saw the pup trying to cross a busy street. As soon as he could, the cop stepped in front of the oncoming cars and trucks, stopping them to make sure the dog could safely cross the road. Is there anything more heartwarming than seeing people go out of their way to help animals in need? India has long been home to the Pariah Dog, one of the world’s oldest canine breeds. In slightly varied forms, the Pariah Dog has existed for over 14,000 years all over Asia and North Africa. Most rural families own at least one. As villages and rural areas turned into cities, these dogs became stray dogs. The stray dog population is regularly increased by callous owners who abandon their pets on the street. Responses to "Indian Policeman Stops Traffic To Let Dog Cross The Road "
this guy earns my repect !